Ideas, anachronisms, social commentary, lens flare. These are some things about the new Star Trek show. Well, in Peak TV, all Hot Takes are destined to cool significantly by the time the photons even reach your eyeballs. So this might be a little all over the place. I hope you’ll forgive me. Spoilers for Episodes 1 & 2 of Discovery. First, the theme music. It sounds like the original series opening mashed up with the opening from Sherlock. That’s fine. After Enterprise’s excruciating “Faith of the Heart,” this was a sound for sore ears. Our first new alien crewmember of the U.S.S. Shenzhou is Saru; in part he’s your typical Trek-type bumpy-faced alien, but he’s also inhumanly tall enough not to make those of us now spoiled by Disney’s Star Wars to roll our eyes. There’s kind of a lot of exposition – which, again, is actually pretty solidly Star Trek. This isn’t just Star Trek, it’s a Star Trek pilot, so blatant exposition is par for the course, but then again there actually seems like there’s less of it than in earlier Trek series pilots. They’re not trying to cram introductions to every single character in here like they would have had to do in a 1990s network television pilot. 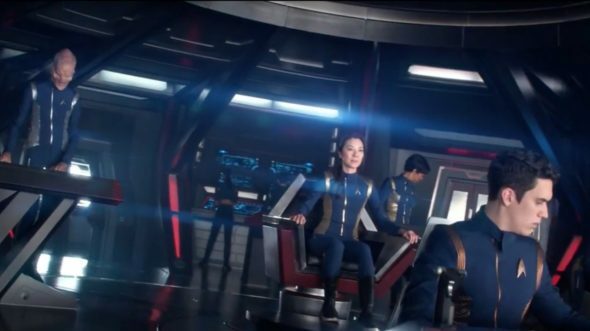 The bridge of the Shenzhou features a guy with flashing lights on his head and some of robot, neither of whom get any kind of intro at all. And that’s fine. That was a good choice. Audiences are more sophisticated than they were the last time Trek was on television – or at least more sophisticated than television networks thought that we were back then. Here’s some of the stuff that bugged me. Every time Star Trek goes back into its history (the last television series, Enterprise, was set more than a century before the Original Series; Discovery is set only ten years earlier than Kirk’s five year mission) things get more and more anachronistic. Technology that just should not exist yet…exists. The transporter pads shouldn’t have touch screens, not until Next Gen. They didn’t get holographic communication working until Deep Space Nine, so what’s it doing here, almost 120 years earlier? The Shenzhou is supposed to be an old ship, but it’s even more futuristically designed than the Enterprise-E of the Next Generation movies. And yet for some reason they can’t transport someone to the ship without lifesigns? Come on. I know this is a weird thing to get hung up on, a weird thing to strain the suspension of disbelief but… still. Point is, the show looks good – but kind of too good? I get not wanting to make things cheesy for the sake of visual continuity with older series, but then why not set it in the future? I think we’re all ready for a post-Voyager, post-Nemesis series. Well, maybe the next one. There’s also a ton of really distracting lens flair which I can only assume is meant to be an homage to J.J. Abrams. 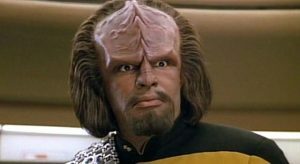 The way the Klingons look. Okay, why? Just…why? 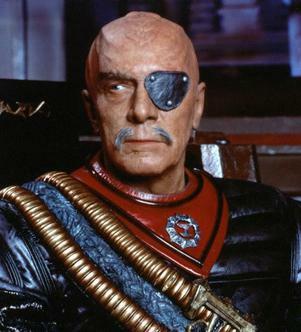 While the Klingons have definitely evolved visually and culturally over the past 50 years of Trek, going from being swarthy Space Russians to ridgy-skulled Space Samurai-Vikings, now they’re – what – Space Ancient Egyptians? 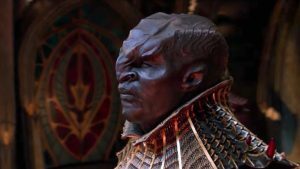 A lot of the Klingon cultural stuff the show gets right, according to what’s been established already. Besides the fact that Klingons do not entomb their dead. But the redesign… I just can’t get past it. It seems so senseless. Star Trek has always been primarily about ideas – that’s why the recent movies have been so bad, because they were just dumb action flicks – and hearteningly there are the beginnings of some verrrrrrry interesting philosophical inquiries in here. The main character, Lieutenant Commander Burnham, is a human whose parents were killed by Klingons when she was young, and she was subsequently rescued and raised by Vulcans – actually her life was saved by a mindmeld from Spock’s father, Sarek). This makes her an interesting counterpoint to Worf, who was a Klingon raised by humans after being orphaned at the hands of Romulans. 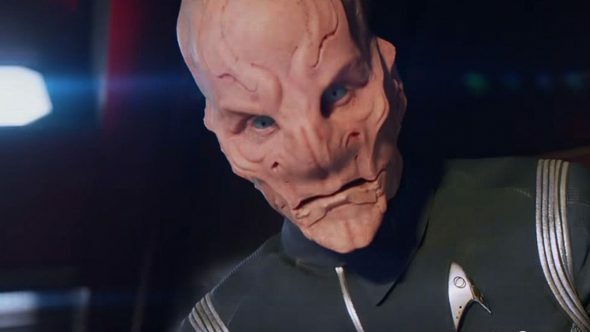 We haven’t seen many humans who grew up in alien cultures in Star Trek before (besides that one kid, Jono, raised by Talarians in that one episode of Next Gen), so Burnham makes for a very welcome new type of character. Doesn’t sound very Starfleet, does it? It isn’t, and that’s important. The Klingons’ plan here is to provoke a war with the Federation in order to unite the Empire’s warring houses; this is seen as necessary precisely because the Klingons fear that if they don’t fight the Federation, they’ll become like the Federation, or even be tempted to join it one day. In other words, they’re concerned about Federation cultural imperialism. This is a theme that has been touched on before in Trek, notably in Deep Space Nine, although only a little. The idea that the Federation, and human cultural values generally (“sweet and cloying” like root beer, as Quark the Ferengi bartender put it), was actually even more insidious than the Borg (in the words of turncoat Starfleet Commander Eddington). The Borg, at least, were honest about their goal of total assimilation. The Federation, on the other hand, will just respect you so hard, will act so admirably and aspirationally that they’ll have you begging them to dilute or dissolve your own culture and let you assimilate into theirs. Those are some ideas worth exploring. TIME FOR SOME GAME THEORY! The Vulcan strategy as described in that episode is a way of handling iterated prisoner’s dilemmas. So we all know the basic structure of the prisoner’s dilemma, right? Two players, each can either cooperate (be nice) or defect (be mean). If you are nice and your opponent is nice, things go pretty well for both of you; if you’re mean and your opponent is mean, then things go pretty badly. But if one player is nice and the other is mean, the mean player gets a big payoff and the nice player gets punished. If you just play one round, the dominant strategy is to be mean (for reasons that I won’t go into here). But if you’re going to play round after round after round with multiple partners, that doesn’t work so well. Instead, it’s better to be nice in the first round, and then continue to be nice until and unless the other player is mean to you. When that happens, you lose big on that round — but then you’re mean to that player forever, so they can never burn you again. If there are enough rounds (and at least some non-jerk players), this turns out to be a more logical strategy. The Vulcans are always nice to the humans — the “points” that they collect for this, over time, outweigh the points that they lost by getting burned by the Klingons that one time. But I think I’ve read that the Vulcan strategy is not actually optimal. In a long enough game, with a wide enough assortment of players, you’re better off adopting a Vulcan-lite strategy where you punish defectors *most* of the time… but occasionally, randomly, you try being nice to them again. And if they’re nice to you in return, you go back to being nice forever. This avoids a trap where two Vulcan-ish players get off on the wrong foot and end up in a scenario of eternal pointless conflict. This is a bit of an odd Prisoner’s Dilemma, since as we see in Episode 2, the Klingons don’t have a viable “nice” strategy that produces positive outcomes for them. Further, the Federation has a literally galactic problem if they miscalculate and somehow come off looking like they attacked a Klingon ship without provocation. I got a whole article on this coming tomorrow, complete with not one, but two 2×2 matrices! I thought of posting this on the “Never watch a pilot” article but decided to go here since I assume post people reading this thread have seen the Discovery pilot and won’t mind spoilers. So, based on the “coming this season of Discovery” clips at the end of the second episode, it appears the rest of the series will be dramatically different from what’s set up in the pilot (and how can it not be, given that they blew up pretty much everything in the pilot). So the opening two episodes, rather than establishing the series, instead serve as a sort of prequel to Star Trek: Discovery. I’m guessing this was a marketing strategy to get fans on board with paying for All Access, as I couldn’t imagine this story structure working in a traditional broadcast series: imagine if the first two episodes of Voyager were all about Chakotay’s adventures with the Marquis, or if The Menagerie had actually been the pilot of Star Trek with the remainder of the series following Captain Kirk with no mention of Pike. Hard to say until we see more episodes, but can we safely dismiss all the events of the pilot as backstory and character development that informs Michael without really being necessary to the arc? Is there a version of Star Trek: Discovery that could be made where the events of the pilot play out in a compressed 5 minute sequence and then jump to the real story, a la the opening of DS9? This is a very interesting question, and we’ll kind of have to see how the rest of the series plays out. 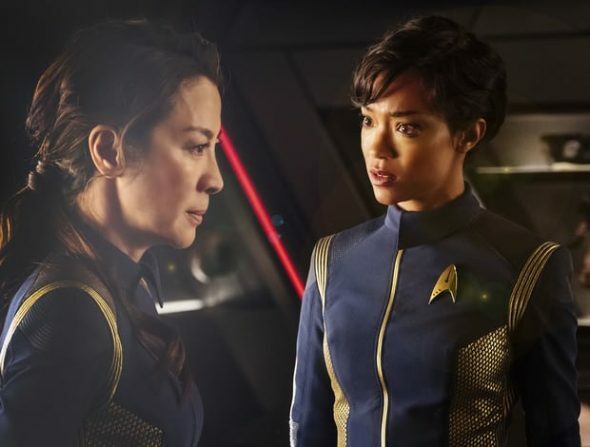 In the Trek series up to this point, the episodes have usually been about the space-anomaly-of-the-week — meaning that the characters are basically the same people, and in the same position, in every episode. (Of course there are exceptions, but they’re exceptions.) One thing that they *might* be doing differently, with this series, is plotting out a large-scale character arc for Michael and using each episode to advance that. If we’re really going to stick that close to her, then the pilot did exactly what it needed to. You could convey the same information in a five minute flashback, that wouldn’t really be the same: if the show is The Saga of Michael, then the experience of jet-packing over to the Klingon ship becomes an integral part of the narrative. It will also be interesting to see how they use Michelle Yeoh going forward. It might be that she’s just gone — she’s probably pretty expensive. But I feel like they might at least have contemplated a show where Michael is always consulting these two absent advisors: Sarek as a telepathic presence, and Philippa as a memory (or who knows, maybe as a carefully programmed holodeck NPC) who pull her in different directions. If that does turn out to be where the show is going, then episode 3 will be a lot less of a hard reset than we thought. Finally, it seems like a big part of the show is going to be about Michael’s relationship with Saru. This couldn’t really be squeezed into a flashback. Sisco’s backstory was private to Sisco: if it’s just a lurking secret in his background, that might not matter much. But if Michael and Saru have bad blood that’s related to this specific incident, you either need to show the incident or spend a whole episode having the two of them argue over what really happened and what it meant, the way you would in a stage play.